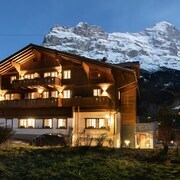 Beautiful location on a hill where you have marvelous views of Eiger and Jungfrau on a clear day. Breakfast was very good. Climbing the hill from the train station is quite a workout, but worth it for the great view and being above the noise of the main street of town. The proximity to the train station is perfect. Hop off the train and you walk directly into the hotel. All meals and Breakfast was very good. Staff were very attentive and friendly. Where to find Grindelwald hotels near an airport? Where can I find hotels in Grindelwald that are near tourist attractions? If you're thinking of planning to stay in the Bernese Alps area and you're looking for a place to stay in Grindelwald, you have a wide array to select from. You can search 36 places to base yourself within 0.1 kilometres (0.06 miles) of downtown Grindelwald on Expedia's up-to-date booking pages. Would you like to find a bed where the action is in Grindelwald? 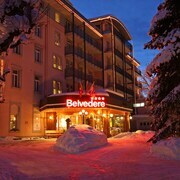 The Romantik Hotel Schweizerhof Grindelwald and Belvedere Swiss Quality Hotel are located a short distance of the town center. Families, students and the more budget conscious can choose from nice Grindelwald room options that won't blow holes in the wallet. 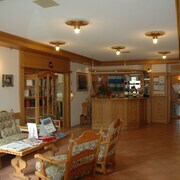 0.1 kilometres (0.1 miles) from Grindelwald's center is the Derby Swiss Quality Hotel. The Central Hotel Wolter is only 0.1 kilometres (0.06 miles) away. 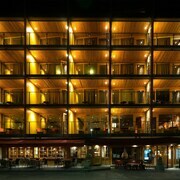 The Tschuggen and the Steinbock Hotel Grindelwald are some other lower priced places that you could investigate. 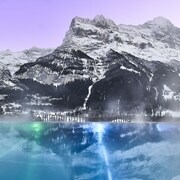 15 kilometres (9 miles) away from the center of Grindelwald, is the Victoria Jungfrau Grand Hotel & Spa. Alternatively, the Beausite Park Hotel is 9 kilometres (5 miles) away. 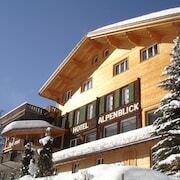 Some other Expedia-listed hotels are the Hotel Silberhorn and the Hotel Caprice. Consider spending a day or two visiting Grossstrubel Mountain and Engstligenalp, in Adelboden, 40 kilometres (24 miles) to the west of Grindelwald. 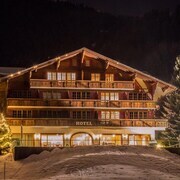 The The Cambrian and Parkhotel Bellevue & Spa are some of the Expedia-listed hotel and apartment alternatives in Adelboden. 60 kilometres (36 miles) to the west of Grindelwald, you'll also find Gstaad - Saanen, home to the The Alpina Gstaad and Park Gstaad. The Wispile Gondola and Ski Lift Eggli are just a couple of the more popular sites to see should you visit Gstaad - Saanen. Get your sporting fix by making a visit to Stade de Suisse Wankdorf, which is 55 kilometres (36 miles) to the northwest of Grindelwald. For those who are keen on booking a room close by, make a reservation in the Hotel Bellevue Palace or Hotel Schweizerhof Bern. If you are flying into or out of Belp Airport and choose to stay nearby try Apartments Justingerweg or Hotel Sternen Muri. 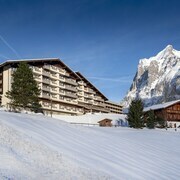 What are the most popular Grindelwald hotels? Are there hotels in other cities near Grindelwald? What other types of accommodations are available in Grindelwald? Explore Grindelwald with Expedia.ca’s Travel Guides to find the best flights, cars, holiday packages and more!